Sorry, I've pretty much given up on trying to get a good background in a photo in this apartment. 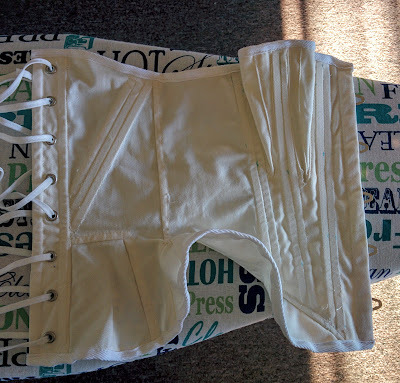 The Challenge: #5, Holes - how would a corset function without the eyelets to lace it together? 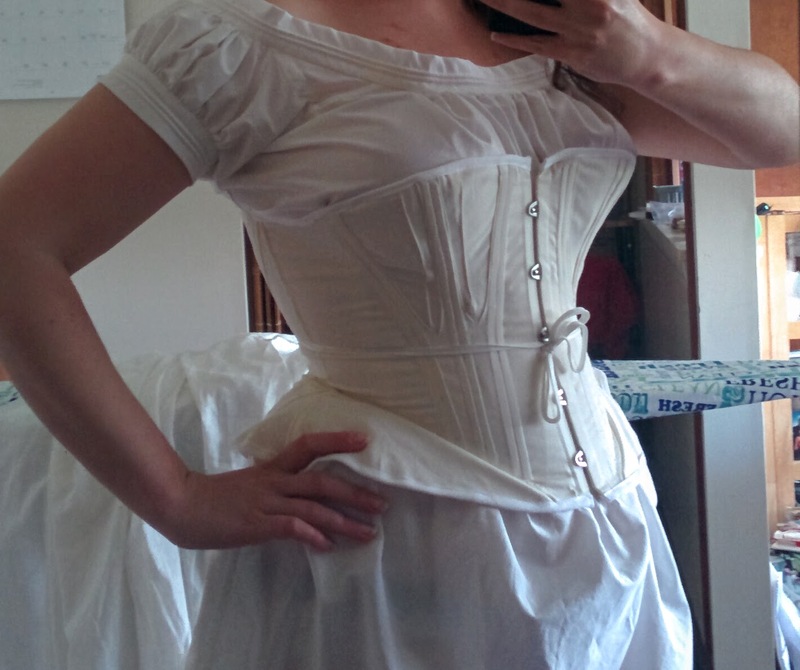 Fabric/Materials: Off-white cotton twill from my corset stash and heavy white twill tape. Originally I was going to cover it with satin, but in the end I'm glad I decided to make this a wearable mockup, as the pattern needs a little tweaking. Pattern: Based on this corset patent applied for by Mina Sebille, with some alterations and boning arrangement based on this corset at the Victoria & Albert Museum. I've been using one of your standard ungored, shaped-pieces corsets for a few years, and while it's been working well, it doesn't have enough hip spring to give me waist reduction. I figured a corset that had a separate hip piece would help me get the flare I needed. Which it does, to some extent! At least, I'm not getting much more reduction, but I am also not getting that lower back pain from the corset being too tight. Year: The patent is dated 1863! Very specific. Notions: A busk, of course, two-piece metal eyelets, and German plastic whalebone. And a corset lace. How historically accurate is it? Quite. The boning is the least accurate thing about it, as it's plastic - but when in the channels, it does give a feel quite like actual baleen (and you can cut it down when you accidentally sew the channels too thin, which is excellent). I'm not quite sure about the fit - I worry I'm getting too much outward projection and uplift at the bust, but then, as long as I'm not getting that horizontal crease out from the armpit it probably does fit well enough there. I'll just have to remember to pad any bodices I make to wear with this to smooth out that area. Total cost: Unknown at this point, I've had some of these parts around for a long time. It's interesting to wear a corset without side boning, and it definitely makes me see how the engineering is really about the cut of the fabric rather than the strength of the boning. Great job on that corset, and it fits you perfectly! I can't wait to see you in an entire 1863 outfit. Are you going to start doing Civil War reenacting?